"There is honour among thieves, but you ain't no thief." 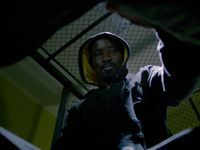 Cottonmouth has played his ace, and Luke Cage now had to walk a legal tightrope. When Shades Alvarez revealed he knew Cage's true identity - Carl Lucas - Cottonmouth didn't seem to do anything with it immediately. 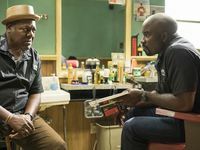 There was enough time between that revelation and "Manifest" to be forgotten, but Cornell Stokes' power play was another perfect scene between Mahershala Ali and Mike Colter. It came immediately after we learned more about Cornell, Mariah (Alfre Woodard) and Mother Mabel Stokes, and more specifically, Cornell's introduction to the street life. It shows the no-nonsense Mabel, who had been built up as a Godfather-esque boss, in action, and chronicles Cornell's accelerated growth from boy to man. 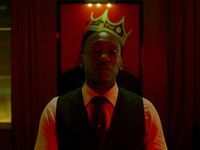 While Cottonmouth struggles to accept the role he has to fill, Mariah is shown to have the same poise under pressure as Mabel, and that, it turns out, is the ride of Harlem's next big power. As that story unfolds, Cage is faced with a major decision of his own. Given Cottonmouth knows about his real identity, Cage's fear of returning to Seagate leaves the Power Man to seriously consider leaving town. Before he can make a final call on his next move, Judas, and the man we have to assume is Diamonback, both make their debut appearance. This episode turned Harlem on its head, and with Cage down for the count, Mariah's rise to power and Diamondback's arrival, this story is far from over.